Mega migration: We bear witness to some serious migration in Costa Rica. Literally millions of swallows, Chimney Swifts, and raptors take the migrant express through the skies over the Caribbean slope. Hit the coast these days and you will see that river of birds but there won’t be as many species as Eilat, nor as many chances at vagrants, and especially, not as many raptor species. Migration is always cool to watch but at Eilat, Israel, it is truly a spectacle to behold. If it’s not the top migration site on the globe, Eilat is a strong contender. 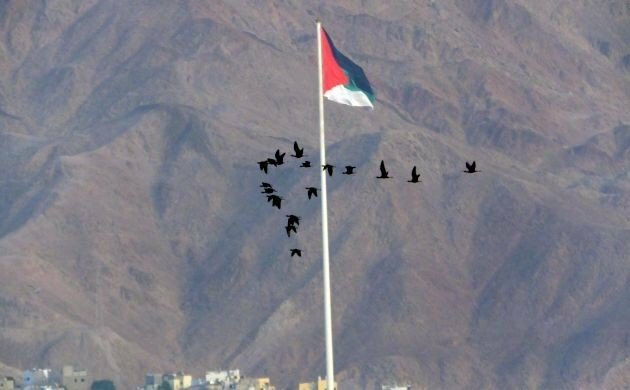 During spring migration in Eilat, every day is like a birding dream. Stuff just keeps flying overhead, coming in from the ocean, and appearing in parks and vegetated wadis. 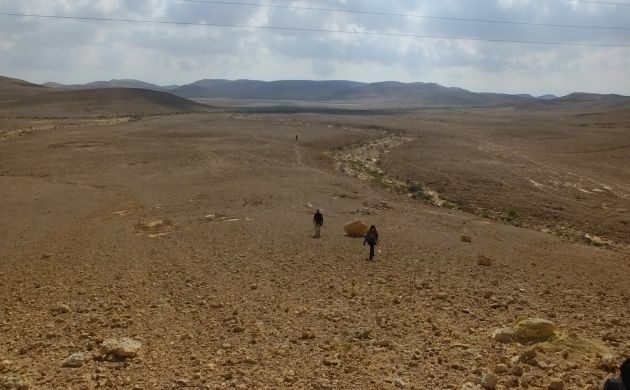 The more you look, the more you find, and it seems like just about anything is possible- just take a look at the Israeli checklist and the high number of vagrants that have appeared there. Not just a few but literally dozens. 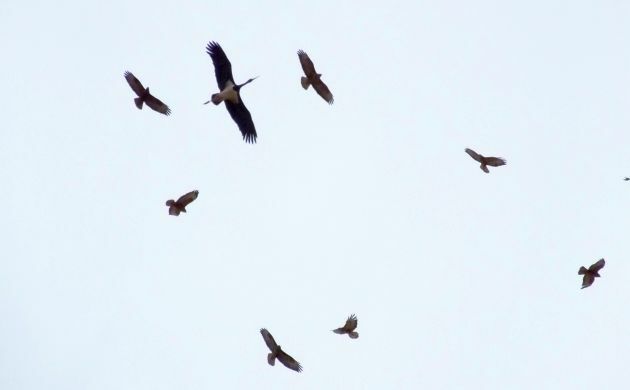 A Black Stork flies with a bunch of Steppe Buzzards and Black Kites. Exotic birds: It’s all in the eye of the beholder but even the most objective birder can’t help but admit that some birds look more exotic than others. In tropical Costa Rica, we have our fair share of exotic, cool-looking creatures. Screaming macaws come to mind along with weird cotingas and colorful dancing manakins. 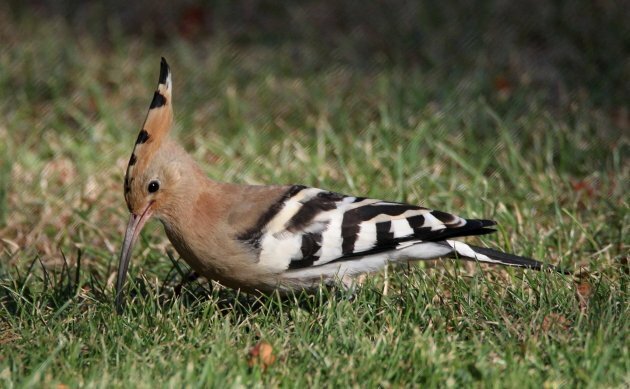 In southern Israel, I think of the Hoopoe and bee-eaters. With its pinkish and black plumage, long, sandpiper like bill, and crest, the Hoopoe can’t help but be exotic. The same goes for bee-eaters, especially when a flock flies in where multicolored birds swoop back and forth, all the while calling like Myiarchus flycatchers. It’s a holy smokes, mind-blast moment that keeps feeding the birding dreams. 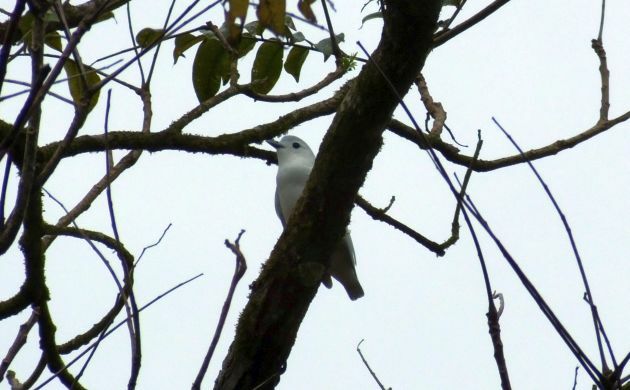 Snowy Cotinga– one of those cool, exotic birds from Costa Rica. Different continents = Very different birds: This no brainer kept coming into play when Spectacled Bulbuls foraged in bushes around the hotel, when bunches of Silvia warblers made ticking calls like a train of Black-throated Blues, and when the local starling wasn’t “a starling”. On the other hand, there weren’t any kingbirds or other tyrant-flycatchers, no bubbling songs from wrens, nor beautiful tanagers trooping through the trees (not many trees in the desert anyways), nor trogons. Tristram’s Starling was common in town. 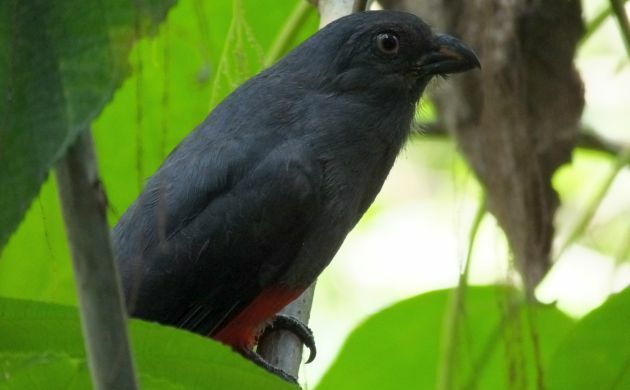 Trogons are fairly common in Costa Rica. 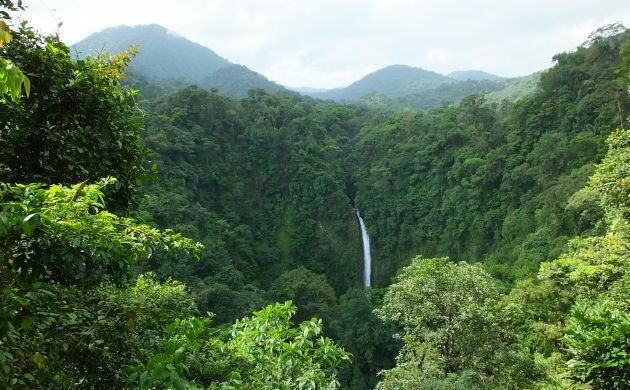 Habitat: As with most places during these modern, heavily populated days, habitats in both Israel and Costa Rica are often threatened with conversion to agricultural landscapes. This is a serious issue around Eilat and seems to affect local resident breeders more than migrants. In Costa Rica, it’s not so much a problem in protected areas, but acts as a barrier to habitat restoration and reforestation on private land (and yes, we do need quite a bit of reforestation in Costa Rica). In terms of types of habitat, the only similarity I noticed was salt ponds that attract waders. It kind of reminded me of Chomes. Everything else was vastly different (as might be expected when comparing the xeric Rift Valley with humid Central America). Nothing like this in Costa Rica. Nothing like this in Israel. Infrastructure: Pretty easy in both places but much less traffic around Eilat, and much better roads. Restaurants and hotels also easy to come by in both places. Military training: Since Costa Rica lacks an army, this was a pretty big difference. 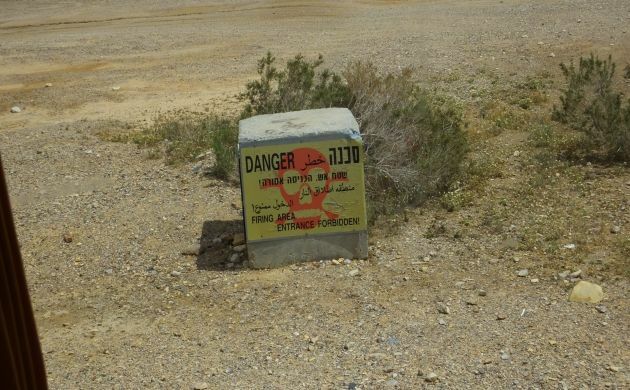 Near Eilat, sometimes, roads are closed due to training, and some areas are sort of off limits. This warning might keep you away. We still walked in for 100 meters anyways. Bird races: One major one for Israel, none for Costa Rica. Given the greater need for conservation funding in the Mediterranean, the Champions of the Flyway plays a critical role. Nevertheless, it would be mega fun to have a bird race in Costa Rica! Any volunteers? Let’s get one going! All birders wear binoculars: No matter where you go, birders all wear binoculars. In other words, we share a deep appreciation for the avian aspect of life, we smile together when we see a Booted Eagle or a trogon in beautiful light. We “grok” the natural magic of migration and are willing to work hard to protect what we love. I started birding when I was seven, was intrigued by the natural world before then, and can’t help but see other birders as part of my extended tribe no matter where you live. At the end of the day, whether you go to Eilat or Costa Rica, the birding is always going to be good. I suggest visiting both places at some time or another to round out the birding life. Patrick O'Donnell became a birder at the age of 7 after seeing books about birds in the Niagara Falls, New York public library. Although watching thousands of gulls in the Niagara Gorge was sublime, more bird species (and warmer weather) eventually brought him to Mexico, Costa Rica, Ecuador, and other very birdy tropical places. 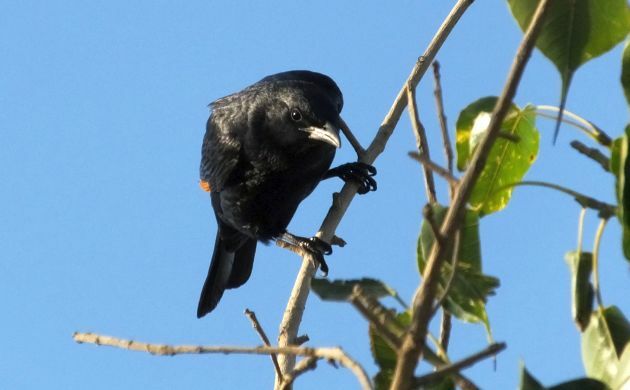 A biologist by training, he has worked on bird-related projects in Colorado, Washington, Peru, and other locales, and has guided birders in Peru, Ecuador, and Costa Rica. These days, he lives in Costa Rica where he juggles guiding, freelance writing, developing bird apps for Costa Rica and Panama, posting on his Costa Rica birding blog, and discussing dinosaurs with his young daughter. You won’t be forgetting your experience in Eilat any time soon then?! Where Are You Birding This Third Weekend of April 2016?